A more thorough definition of maximum bid. The importance of your maximum bid to your PPC efforts. How to reduce your paid search bids and costs by optimizing for Quality Score. Maximum bid is the absolute most you are willing to pay for each click on your ad when it appears in response to a keyword or group of keywords on the SERP. Your maximum CPC bid can be assigned to an entire group of keywords or to an individual keyword. Your max bid matters because it affects how much you pay for ad clicks, which of course affects your overall PPC costs. Your maximum bids serve as your keyword-specific budget; they tell the search engines how much you are willing to pay for a click from a given keyword. Thus, maximum CPC lets you determine how much you'll pay for an ad, and where that ad will be positioned; two very important aspects of pay-per click marketing and AdWords bid management. Your maximum bid isn't the only thing that affects how much you pay and where your ad shows up. Your Quality Score also has a major effect on your cost per click. Google uses the Quality Score system to reward advertisers who create more relevant ads that are more valuable to users. This means that if you can earn high Quality Scores, you can end up ranking higher than other competitors, even when they set a higher max bid! Keyword relevance - How closely related your keywords are to one another. Ad text relevance - How closely your ad text relates to the queries you're bidding on. Landing page relevance - How similar the page you send visitors to is to their search and your ad text. Click-through rate (CTR) - How often people click on your ads. Your CTR is especially important here. It's the best measure that Google has of how well people are responding to your ads, and whether or not they find your ads to be relevant to their needs in the moment that they perform a search. By answering each of these challenges, you can increase your Quality Score and place your ads higher without raising your maximum bids. 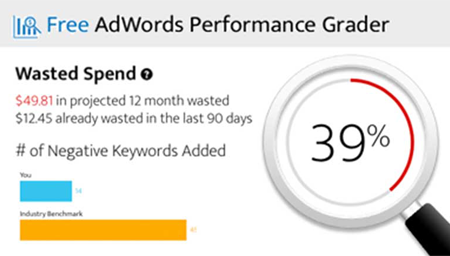 As such, optimizing for Quality Score is an excellent way to contain your PPC costs and make your budget go farther.